Councillor Logue, centre, is warning of a council tax increase. 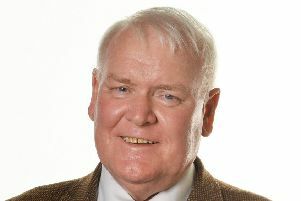 North Lanarkshire Council’s leader has warned a three per cent council tax rise is inevitable. Jim Logue says it would be “cowardice” not to increase the charge, having opposed the Scottish Government’s council tax freeze which was imposed 10 years ago. The Government has now ended that policy, allowing authorities to raise bills by up to three per cent when they set their budgets next month. On top of that, many people will have to pay more as the Government is increasing the council tax rate for those with property in the E to H bands. He was speaking after it emerged the council is heading for a showdown with the Government over its funding for the year ahead. The authority claims it will have to make service cuts of £34.6 million and axe 120 jobs if it accepts Government budget proposals. Councils have been warned they will lose money if they don’t agree to what’s on the table by this Friday. Councillor Logue has written to finance secretary Derek Mackay saying the council is not in a position to do so. Union officials have been given advance warning of redundancies and GMB Scotland organiser Barry Fletcher warned of a “brutal” year ahead for councils. He added: “Another 120 jobs going is a significant cut to services that have already been cut to the bone. Mr Fletcher called for “clarity” on where the cuts will be made, but Councillor Logue said it’s too early to say. Councillor Logue denied that his stance on the budget is a political stunt. He said that, with the SNP Government no longer having a majority in the Scottish Parliament, its budget proposals will need support from at least one other party. Cumbernauld and Kilsyth MSP Jamie Hepburn insisted the Government’s draft budget represents a “strong settlement” for councils.